On the surface, replicating a real television broadcast with a sideline camera angle seemed like a good idea. While games such as World League Basketball and Michael Jordan in Flight did impressive things with early 3D graphics, their camera angles didn’t always provide the best view of the court. Games like Lakers vs Celtics did offer a much better view of the court, but they weren’t always ideal for representing the players in a three dimensional space. As noted above, it was a lot easier to step out of bounds accidentally, and although the visual effect was certainly acceptable for the time, it’s awkwardly trying to represent 3D on a clearly two dimensional plane. When EA Sports followed up NBA Showdown with NBA Live 95, they changed the game in a lot of ways. 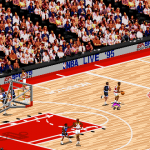 NBA Live 95 was a huge leap forward in terms of simulation basketball games starting on the road to where they are now, with one of the most noticeable changes being the new isometric camera angle. Instead of a sideline view, the court was now displayed at an angle that had more of a three dimensional look. The court was also bigger, which combined with a clear view and better perspective, made it easier to avoid stepping on the lines. Even though it wasn’t true 3D, it was a better simulation than the perspective attempted in earlier games. 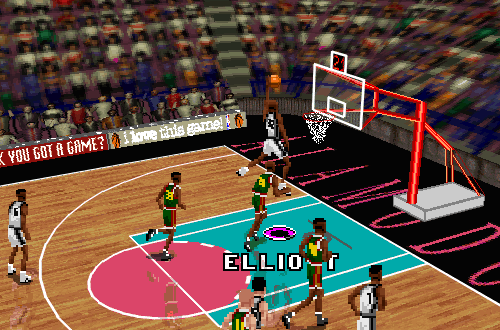 It should be noted that NBA Live 95 was not the first basketball game to adopt an isometric camera angle. One example would be David Robinson’s Supreme Court for the SEGA Genesis, which had used a very similar angle two years prior. NBA Live 95 was the superior game however, and certainly more notable, being multi-platform and NBA licensed. The change was certainly popular, and set NBA Live apart at a time when we were beginning to demand more of sports video games. Had EA stuck with the mechanics and camera angle of the NBA Playoffs series, NBA Live wouldn’t have become the dominant brand of virtual hoops by the late 90s. While the isometric camera angle in NBA Live 95 provided a much better gameplay experience than the angles utilised by its predecessors, it wasn’t without its quirks. Because of the angle, moving players straight up and down the court was no longer a matter of pushing left and right; rather, it now required diagonal movement. In other words, to head straight up court towards the basket at the top of the screen, you’d need to push up and right. Running towards the other basket was conversely achieved by pushing down and left. However, there was a controller option that allowed users to switch between absolute and screen-relative movement that could simplify things. Looking back, I believe playing on that isometric angle affected the way that I play basketball games, even to this day. It left me with a tendency to take most of my shots from the side closest to the camera. I also find that I attempt a lot of my three-pointers from the wing, at a roughly forty-five degree angle to the basket. That may also be because I once heard that that was a hot spot for making threes in those old games, but if nothing else, shooting from that area allowed for the most amount of space between the three-point arc and the sideline, while also keeping the player close to the camera. It’s funny how many of these old habits have stuck with me in newer games! 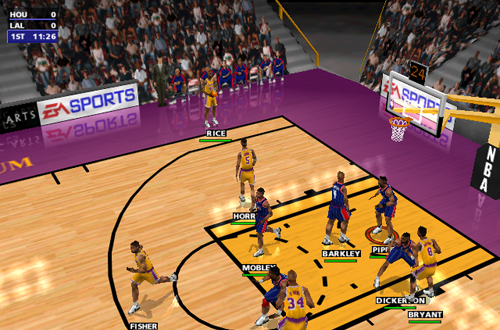 The 16-bit versions of NBA Live would retain the isometric angle as the only camera option through NBA Live 98, but starting with the PC and PlayStation versions of NBA Live 96, multiple camera angles were introduced. Furthermore, the default angle was the new EA Cam, a baseline camera not unlike the ones featured in the modern games. The isometric angle was now available as the Classic Cam, and in NBA Live 96, it came in two varieties: the same angle and movement as in NBA Live 95, and a version in which there was more movement and a zoom-in when players were in the paint. While the new angles were nice, I often found myself playing on Classic Cam. Classic Cam returned in the PC and PlayStation versions of NBA Live 97, though the Press angle was now the default and there was a manual zoom setting for all of the angles, as well as a toggle option for automatically zooming into the paint. The angle remained in NBA Live 98 through NBA Live 2001 and retained the “Classic” label, though it was starting to become outmoded. Since the games were now in full 3D, it was more of a close approximation of the original isometric angle, left in there as a throwback option for anyone who still enjoyed it. Beginning with NBA Live 2002, it was removed in favour of angles that focused on more realistic presentation. By that point, most gamers preferred playing on a TV-style angle, or perhaps one of the baseline or sideline angles that placed us in the thick of the action, following the players in third person. An isometric angle felt outdated with fully 3D environments and a variety of camera options, but before the 3D revolution, it definitely served its purpose. These days it may be difficult to appreciate just how big of a jump it was in terms of visuals, but it gave those games the illusion of 3D and facilitated a better gameplay experience. It struck a good balance of being optimised for gameplay, while retaining an angle that was still reasonably close to a broadcast-style presentation. 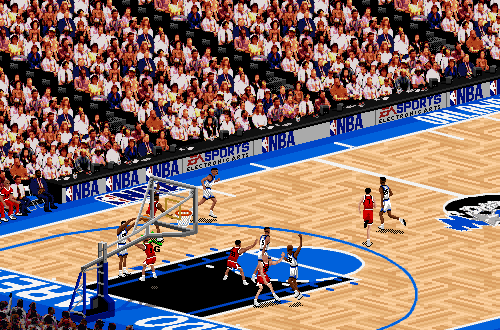 There’s no great need for an isometric camera angle to return in NBA Live except for the sake of nostalgia, but that wouldn’t necessarily be a bad idea. EA’s NHL series has brought back the classic NHL 94 camera angle in some of its modern iterations, and as the historical content in NBA 2K demonstrates, nostalgia is an effective selling point. An isometric angle won’t move as many units as Michael Jordan, of course, but it would be a fun throwback for gamers who have been playing NBA Live for over a couple of decades now. As it stands, it’s one of the best innovations in the early days of basketball gaming, and an iconic gameplay camera that arguably defines the era.